10 –Amy Winehouse Best Friends, Right? Published By – New Thunder Music Co. Designed At – Free Barrabas! This record features unreleased songs and demos. Tracks 1 to 3, 5, 7, 8, 10, 12: Mixed at Metropolis. Track 1: Recorded by Gary Noble at Creative Space, Miami, FL. and Gleyder "GEE" Disla at Instrument Zoo, Miami, FL. Track 2: Recorded at Instrument Zoo, Miami, FL and Doghouse Studios, Henly, Real World, Bath. Track 3: Recorded at Instrument Zoo, Miami, FL and Platinum Sound, NY. Track 4: Recorded at Daptone Records' House of Soul / The Dap Kings appear courtesy of Dap Records. Track 5: Written by NaSir JoNes for Sun Shining, Inc. Recorded by Gleyder "GEE" Disla & Frank Socorro at Instrument Zoo, Miami, FL and Gary Noble at Real World Studios, Bath, England. Nas appears courtesy of Island Def Jam Records. Track 7: Recorded by Gleyder "GEE" Disla and Ben Jackson at Instrument Zoo, Miami, FL and Scott McCormick at EMI Studios London. Tracks 8, 10: Recorded at Creative Space, Miami FL. Track 9: Recorded at La Source Studios, London (March 2006). Track 11: Tony Bennett appears courtesy of Columbia Records / RPM Records / Columbia. Recorded at Bennett Studios, Englewood, NJ. Mixed at Bennett Studios, assisted by Alessandro Perrotta, Brian Chirlo & Adam Bancroft at Bennett Studios and Nicolas Essig at Henson Recording Studios, Hollywood. Mastered at Gateway Mastering, Poland, ME. Track 12: Recorded by Frank Socorro at Amy's House, London and Gleyder "GEE" Disla at Instrument Zoo, Miami, FL and Platinum Sounds, NY. ℗ 2011 Universal Island Records, a division of Universal Music Operations Limited except track 6 ℗ 2011 Mark Ronson under exclusive license to Sony Music Entertainment UK Limited, under license to Universal Island Records, a division of Universal Music Operations Limited and track 11 ℗ 2011 Sony Music Entertainment, under license to Universal Island Records, a division of Universal Music Operations Limited. Track 1: Bourne Music Ltd. / Universal-MCA Music Publishing. Track 2: EMI Publishing / Linden Springfield (BMI) / EMI Blackwood Music Pub. Track 3: EMI Music Publishing Ltd. / Jobete Music / EMI Music Ltd.
Track 4: Screen Gems-EMI Music Ltd.
Track 5: EMI Music Publishing / Linden Springfield (BMI) / EMI Blackwood Music Pub. / Universal Music - Z Songs (BMI). Track 6: EMI Music Publishing Ltd.
Track 7: Corcovado Music Corp. / New Thunder Music Co / Songs of Universal, Inc. Tracks 8, 10: EMI Publishing. Track 9: EMI Music Publishing Ltd.
Track 11: Bug Music, Inc. (BMI) / Druropteal Music (BMI) / Range Road Music (ASCAP) / Warner (BMI). Track 6 was originally a Mark Ronson track but that is not credited as such on the release. Erratum: on track 12 Currie Scherer is credited for French horn but there is no such musician. Currie comes from the second name of Barbara Jöstlein. The magic was gone. 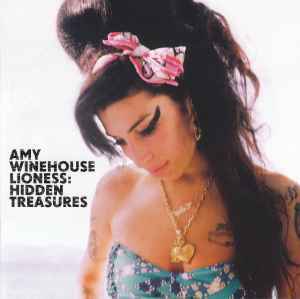 A sad collection of recordings featuring Amy sounding mostly out of it, slurring her words at times. Remember her for Back to Black. Sad that we never got the Alice in Wonderland concept album she promised us at one stage.